As predicted, President Trump’s State of the Union address on Tuesday was a call for unity. It’s a welcome goal, one we is desperately need in today’s contentious political atmosphere. “(W)e must reject the politics of revenge, resistance and retribution, and embrace the boundless potential of cooperation, compromise and the common good,” he said in his 80-minute speech. Surely much of the country agrees with the president. Much of the hate crime that plagued his first year in office has largely subsided, and Americans everywhere are calling for greater tolerance, both in Washington and the nation at large. Reaching that goal, however, won’t be easy. The House chamber held an apparent air of defiance among many of the Democratic members of Congress who have been emboldened by their success in the November elections. 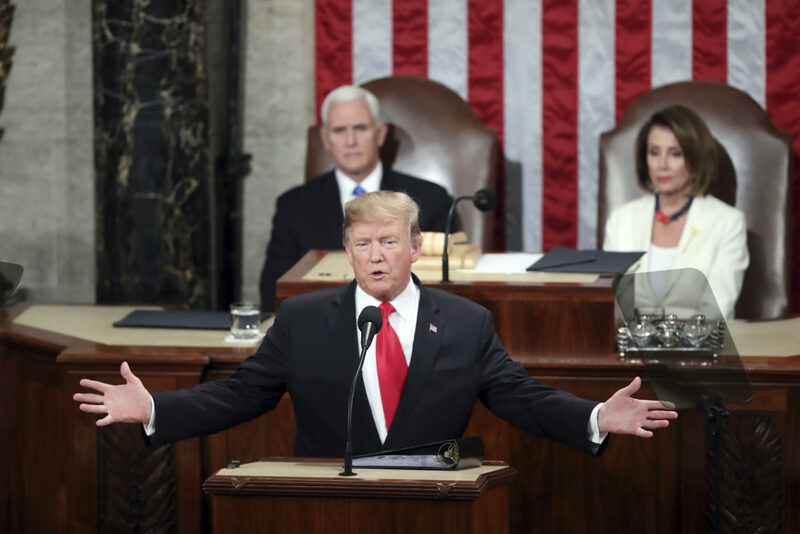 And the president himself belied his call for unity in other parts of his address, where he repeated many of the demands that have contributed to the current legislative impasse at the Capitol. Trump once again blasted the investigation into his alleged relationship with Russian agents who sought to influence the 2016 election. “An economic miracle is taking place in the United States, and the only thing that can stop it are foolish wars, politics, or ridiculous, partisan investigations,” he said. Such investigations, however, are extraneous. The president should simply ignore it and let it either progress or die, while he focuses on the business of governance. The investigation itself should not impede the everyday work of the administration or Congress. He also repeated his insistence on building a border wall, repeating statements about rampant crime on the border that are provably false, and saying migrants coming to our border seeking asylum are terrorists and drug dealers. As has been shown in countless news reports, those migrants are everyday people who are trying to escape violence in their own countries, not create in ours. If anything, they have to work their way through possible gantlets of drug cartel-related bandits and extortionists to get here. And has also been repeated over and over, the border is not a lawless bastion of criminals — especially the Rio Grande Valley. Of the 24 metropolitan areas listed in the FBI’s annual Uniform Crime Reports, the Valley consistently ranks at or near the top with regard to the lowest crime rates. And Hidalgo County recently announced that violent crime reported in 2018 was 15 percent lower than the previous year. In suggesting otherwise, Trump insults the many local, county and state law enforcement officials who risk their lives to keep our crime rates low. Unity requires negotiation, something at which the president claims to be an expert. But negotiation, especially in the political process that defines American legislation, requires a willingness to compromise, not a demand for capitulation. It means finding areas of agreement, codifying them into policy, and moving on to the next issue. Trump needs to set the example by showing a willingness to truly negotiate some issues. We would hope, and expect, that lawmakers who already know the political process will respond in kind and come to the bargaining table, regardless of any differences that might exist. Respectful debate and negotiation will go far toward renewing a move toward progress and improving the state of our union.